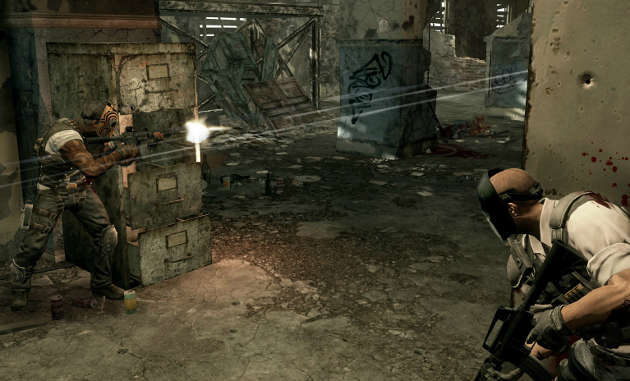 The original Army of Two brought a well needed injection of comedy and action to the shooter genre. Before its arrival games such as Call of Duty and Medal of Honor ruled the roost with their stuffy take on first person shooters. Sure, they were realistic and well made with gripping stories, but they weren’t ‘fun’. Not in the sense of what Army of Two brought to the table, anyway. Both Army of Two and Army of Two: The 40th Day focused on the idea of camaraderie in battle. This is why their co-op campaign element was hard to beat, near impossible in fact. When it was first announced that EA were moving away from the original duo of Rios and Salem and opting for new characters, Alpha and Bravo, fans of the game series were slightly concerned. The partnership of Rios and Salem had ran through the first two games, it was a coupling that fans were comfortable and happy with – their off the wall antics and tongue in cheek humour gave a different edge to what could otherwise have been a boring shooter. 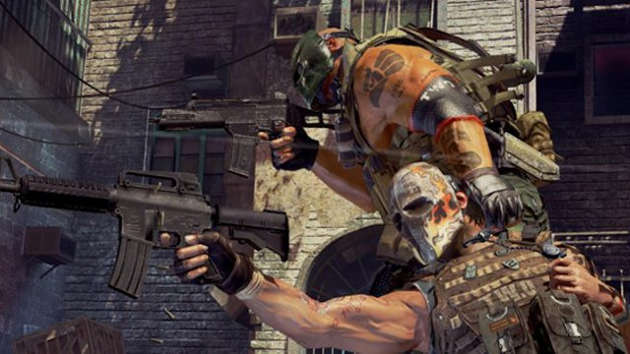 After all, Army of Two is one of our favorite co-op games here at iMG. The new paring seems lacklustre when compared to the original duo. Rios and Salem were charmingly stupid and well, pretty awesome, Alpha and Bravo seem rigid, undeveloped and, in truth, they lack personality. It’s understandable that these characters could seem undeveloped; they’ve been given a starring role in a trilogy of which they’d never before played a part. The original guys do make a return in a number of the missions to lend an experienced helping hand but, sadly, they are NPCs – still, their appearance was a pleasant break from the unnatural and disappointing relationship that had been formed between Alpha and Bravo. However, the story itself was well crafted. Numerous cameo appearances from various different characters kept it feeling fresh and helped break up the awful one liners between Alpha and Bravo that plagued the general gameplay. It was full of action and more than enough excitement for one game, with a few surprising twists and turns that made the storyline one of the best aspects of this title. Shooting your way through the slums of Mexico, crumbling hotel rooms and desert villages was enjoyable, if a little bland. The locations felt as if they were missing a certain depth that games such as Battlefield 3 seem to nail pretty well. It’s not that the game graphics were poor, just that there was a certain lack of attention to detail that its competitors manage so well. The gameplay was slightly less impressive with combat seemingly unchanged from the earlier games. In all fairness, it’s notoriously difficult to make combat effective and engaging in third person shooters. If you want to see a game do it well, check the Gears of War series. The combat system really needed an update to bring it in line with today’s shooters, but sadly EA opted out. They have recycled old features from the original game and, rather than adding something new to the mixer, they instead dropped a few elements from the originals that made them so charmingly quirky. Most noticeable of all is the choice to loose the ability to interact with your co-op partner. In the games of old, Rios and Salem would fist bump, play rock paper scissors and rock out with air guitars in the quiet periods of the game. Alpha and Bravo seem to be under much stricter orders, with ‘fun’ being severely out of the question. Furthermore, quiet periods of game play have been replaced with waves and waves of enemies who seem to run single file into the muzzle of your gun. Yet, combat is still enjoyable, especially when it comes to co-op tactics. Flanking, drawing fire, and dummying are all simple to do and add a ‘we’re in this together’, sense to the game. The co-op campaign is the most important part of this game; it’s what it has been developed for. If you were to play this on your own you would be missing out on a lot of the game’s best features. To be honest, playing this game as a single player shooter will leave you bitterly disappointed. If you’re looking for a single player shooter, try Call of Duty or Battlefield; Army of Two just won’t be for you. It is called Army of Two, after all. EA have added a lot of customisation options, really building on the previous two titles. Players can now create their own masks for Alpha or Bravo leading to some cool creation possibilities. This really lets your creative side shine with endless possibilities for mask designs just waiting to be made. Not only this but it’s possible to customise their kits, guns and tattoos, allowing you to truly make Alpha or Bravo your own – if only they had as much personality as they do outfits. 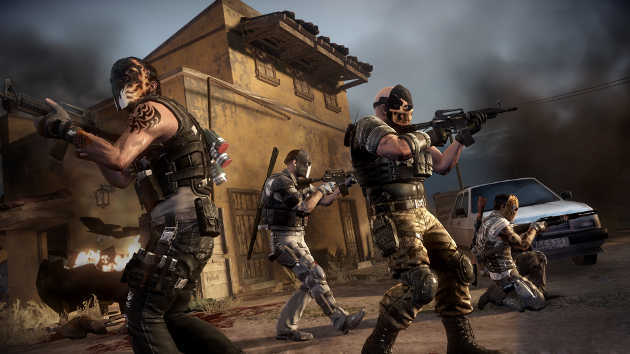 Online multiplayer was first added to the series in Army of Two: The 40th Day, and it was met relatively well. However, online multiplayer has been dropped from this title. EA decided to focus on the campaign rather than spend their time adding a, presumably, unnecessary multiplayer option. Usually this wouldn’t be a bad move. Recently, games have had an unneeded multiplayer element added (such as Tomb Raider and Mass Effect 3) where the campaign was more than enough to keep your attention. However, this title could have used a good multiplayer element to help support the slightly disappointing campaign mode. It could easily have tipped the scales from a mediocre title to something slightly more special. 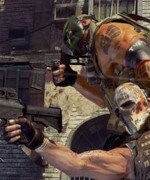 If you can play Army of Two: The Devil’s Cartel with a friend then you’ll probably have a good game on your hands. If your friends seem reluctant to buy the game then it’s probably best to avoid it altogether. This game has had some bad press of late, receiving mixed reviews from critics. It’s not that it’s a bad game; it’s just not a game that you should play by yourself, which was probably EA’s intention. It’s a shame that they decide to change the one thing of Army of Two that made it unique to other shooters. I have fond memories of the first game for sure.